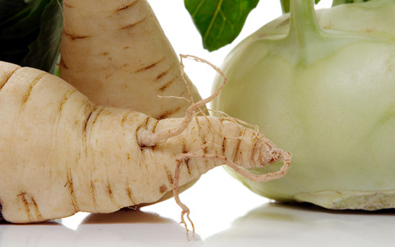 Kohlrabi can be one of those intimidating vegetables if you haven’t been around it much. It has the look of an organic green Sputnik, with a taste like fresh, crunchy broccoli stems accented by radish. The name kohlrabi comes from the German kohl, meaning cabbage, and rabi, or turnip, and that kind of sums it up. Although these green bulbs look like they were dug up from the earth, the round bulb is a swollen stem that grows above ground. Not a commonly used vegetable in American cuisine, kohlrabi is widely used in Central Europe and Asia. It is still patiently waiting to be discovered in this country. Handling: If the kohlrabi leaves are still attached to the bulb, trim them and store separately. If the leaves are in good shapefirm and greenthey can be cooked but will need to be used within a couple of days. The bulbs should be stored, unwashed, in a plastic bag. They will hold for about a week in the refrigerator. Smaller kohlrabi are the sweetest and most tender. Bulbs much bigger than the size of a tennis ball won’t be as tasty and often have a pithy flesh. Simple preparation: Tender, young kohlrabi is delicious eaten raw. Peel the outer skin with a paring knife. Slice, dice, or grate, and add to salads. Use on raw vegetable platters or serve with a creamy dip. Substitute in recipes calling for radishes. Grated kohlrabi can be added to slaw, but lightly salt it first and let stand for several minutes. Squeeze to remove any excess water before adding dressing. Kohlrabi can also be steamed or boiled. For this preparation don’t peel until after they are cooked. Steam or boil until bulbs are tender, peel skin, and season with butter, salt, and pepper, a cheese sauce, or just enjoy plain. If the leaves attached to the kohlrabi bulb are fresh and green, they can be enjoyed as a cooked green. Wash the leaves and remove the ribs. Blanch in boiling water until just wilted, 3 to 5 minutes. Drain and squeeze excess water from leaves. Chop leaves, then saute in a little olive oil or butter. Season with salt and pepper. Add a splash of vinegar or squeeze of fresh lemon juice. Excerpted from Rolling Prairie Cookbook, by Nancy O'Connor. Copyright (c)1998 by Nancy O'Connor. Reprinted by permission of Chelsea Green Publishing Company. Excerpted from Rolling Prairie Cookbook, by Nancy O'Connor. Thank you for these cooking tips. I've never cooked kohlrabi before. I'm looking forward to trying out these suggestions. Have loved Kohlrabi for years, a wonderful and tasty veggie. Yes, finally a site explaining uses for this veggie. We grow kholrabi in MI, I recently have become involved with cross fit and paleo love the cross fit. I use the kohlrabi as a potato substitute in venison roasts along with carrots. We also eat it raw and in salads. I work in FL and it is hard to find. So my visit to my home in MI I will be bringing some back. Thanks! I've had some in the fridge for a little while (a gift) and have had no clue what to do with it!